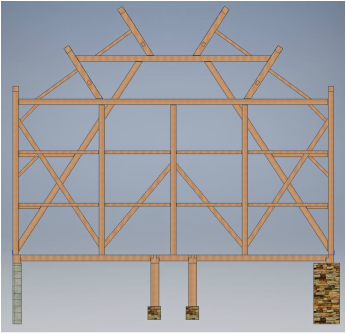 Ohio timber frame bank barn analysis. This barn is oak frame with sandstone foundation. The front wall was replaced with concrete masonry block, and the floor was reinforced to handle equipment loading. All other features are original. The barn dates back to the 1860's and originally had a slate roof (since removed due to deterioration). The barn is mortise and tenon construction with wood pegs. The building is a 1930's open-space building with very cool bowstring trusses and a partial basement underneath. The basement provided some issues because heavy brewery equipment would soon need to sit on a slab that was insufficient to carry the loads. It was determined that, in lieu of reinforcing the floor below the existing slab, it would be more efficient to place steel below the existing floor that would provide an independent support structure for the new slab above. The existing slab was then able to be used as a concrete form until the new slab cured and could itself carry the load to the new structure below. The slab can be seen in the first three pictures, and some of the new steel can be seen in the 4th picture (painted gray). The final pictures are progress pictures as finishing work is well underway and brewery equipment has been delivered and hooked up. The brewery has opened as of Jan 2017!